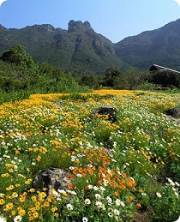 The beautiful Kirstenbosch gardens cover an area of 528 hectares with 36 hectares of cultivated garden. The gardens are a celebration of South African flora - showcasing only indigenous South African plants. Fynbos, proteas, cycads and rolling lawns are intermingled with streams and ponds and well-laid out pathways for easy walking. A great variety of birds inhabit the gardens and the sweeping views from the upper slopes are spectacular. Whether for a casual stroll, a more stenuous walk or a lazy picnic, the gardens are a must-see when visiting Cape Town. > There is a restaurant, self-service area and tea-room as well as gift shops and a nursery. > On Sundays during the summer months from November to April, musical sunset concerts are held on the lawns from 5:30 - 6:30. Concert tickets prices vary. Prices between R60 - R100 for adults, R55 - R75 for scholars and R60 - R100 for Botanical Society members. The gates open at 3:30 so bring a picnic and relax. > The Garden is open 365 days a year from 08:00 - 19:00 (September -March) and from 08:00 - 18:00 (April - August). > Entrance fee is R40 for adults, R25 for SA students with student cards and R10 for children ages 6-18. Children under 6 years are free.